Enchanted Excurse: Oh My Stars! Afternoon Loverlies! 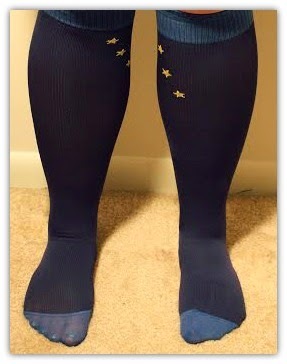 I have finally received my compression socks that I talked about in my Stylish Compression Socks blog post. (I checked to see if the campaign is still going and it is closed. I also don't believe the discount in my last post is working anymore.) 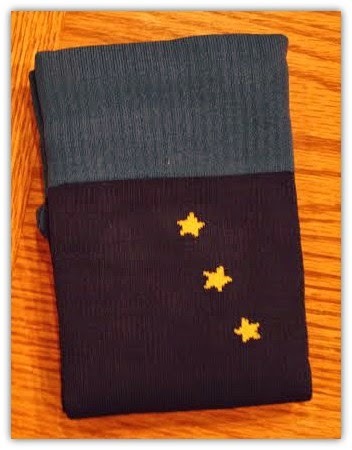 I received the Orion style of the socks. I am very content with receiving the Orion style, they have cute little stars on them. I decided to wear them around the house and also while out looking around at stores. They are very comfortable to wear, but I can't tell yet any difference then if i'm not wearing them. I don't know if you are able to tell a difference. The material is thick and feels very durable, as if they will last me a long time. Compression socks help with circulation and are great to wear when on a plane, or whenever you will be sitting down for a long time. Your legs need circulation in them so they do not develop a DVT (Deep Vein Thrombosis), which is a blood clot. Blood clots can be very dangerous, so it is always best to get up and move around. Soxxy has some cute ankle socks, leggings, knee, and thigh socks. I noticed there aren't many to choose from, but hopefully soon they will have more. Here is a link to their blog so you an keep up to date on what they are doing. :) Have a Blessed day! Excuse my big calfs. LOL They have always been quite big.